Listen to unlimited hindi songs with free Hindi Radio. The Software presented here gets music or songs from online radio stations on internet. Yes this Hindi Radio is totally free to download & use. This Hindi Radio provides buttons just like a physical radio. The buttons in Hindi Radio are Play, Stop, Play Next and Play Previous. This hindi radio has an inbuilt list of radio channels and can be selected with a single click. 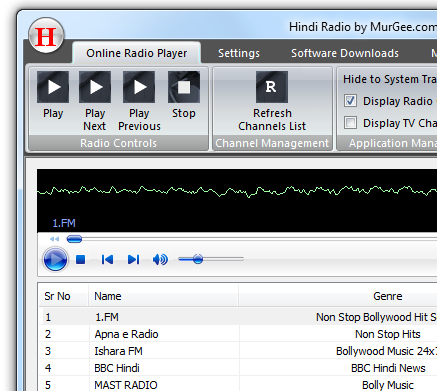 This Free Hindi Radio is an internet radio software which can be used on your Windows 8, Windows 7, Vista or XP version. Yes this software works on 32 bit and 64 bit versions of Windows and is really simple to use. This Hindi Radio provides nonstop music from internet. Download and start listening to unlimited songs from internet. This Hindi Radio provides new, old and other types of songs.